Jurors have been named in the 2019 German Book Prize competition, which will culminate in a winner’s announcement on October 14, coinciding with the Frankfurter Buchmesse. The German Book Prize Academy has named its jurors for the 2019 German Book Prize today (February 5), and submissions are open for this year’s award cycle. Publishers should note that the deadline for submissions is March 27, and the information and form for submission can be found here. Publishers may submit two German-language novels each from their current and/or upcoming lists, and they also can recommend up to five additional titles. Applicants must be members of the German Publishers and Booksellers Association, the Swiss Booksellers and Publishers Association, or Austrian Book Trade Association. The books submitted must be published between October 1 of last year and September 17 of this year when the shortlist will be announced. The books themselves, reading copies, ebooks or galley proofs may be submitted until June 14. The German Book Prize was awarded for the first time in 2005 and is seen as German-language fiction’s leading award. It’s given annually by the Foundation of the German Publishers and Booksellers Association. The winner receives a prize of €25,000 (US$28,549) and the other five shortlisted authors receive €2,500 (US$2,854) each. To be sure the greatest level of independence for the award, the German Book Prize Academy selects a new jury every year. It is possible to be a member of the jury more than once. The novel of the year will be selected through a multiple-stage process. First, the jury will review all of the novels submitted by the publishers and compile a longlist of 20 titles, which will be announced on August 20. From this list, the jurors will then select six titles for the shortlist, which will be published on September 17. These six authors will only find out which of them has won the German Book Prize on the evening of the award ceremony in Frankfurt on October 14, to coincide with the start of the Frankfurter Buchmesse. As Publishing Perspectives readers will recall, Inger-Maria Mahlke won the German Book Prize 2018 for her novel Archipel (Archipelago). 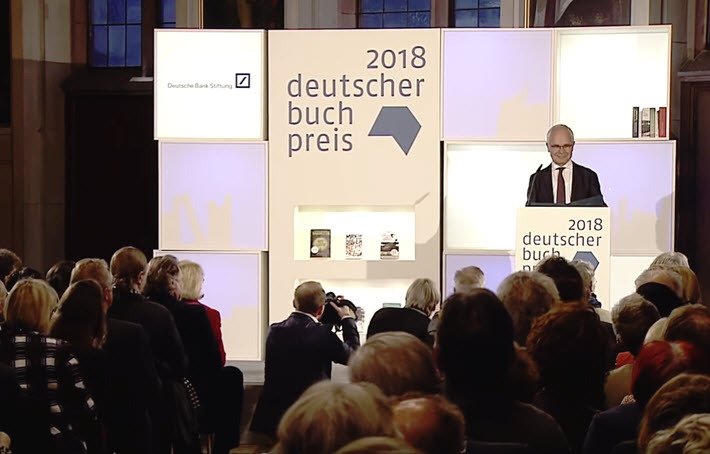 The German Book Prize receives funding from the Deutsche Bank Foundation, and additional partners include the Frankfurter Buchmesse and the city of Frankfurt am Main. The television network Deutsche Welle supports the German Book Prize in its media activities, both in country and internationally. You can follow news of this year’s German Book Prize at hashtag #dbt19. You can see Mahlke’s acceptance speech for the 2018 award at the Frankfurt Römer in the video below. More from Publishing Perspectives on the German Book Prize is here, and on publishing and book awards in general is here.